One product I love hoarding is mascaras. I guess with my eyes being so naturally deep-set and dark, think of your typical Tim Burton character, then I always need to make them look more defined and 'awake' and mascara is one of the things I need to achieve that. Despite the dozens of mascaras I've tried over the years, I have yet to find one that I really love. I've disliked some, I've sort of liked others; but so far I can't say I've found my HG mascara. 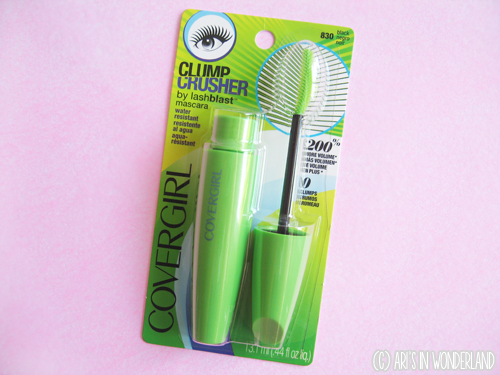 So with hope still brimming inside me that I will, I decided to try out CoverGirl's newest (at least, locally) mascara: the CoverGirl Lash Blast Clump Crusher (Php495.00). I'll admit, I was first drawn to this mascara because of the packaging. I just love the neon green! It was then that I noticed it was claiming to give '200% more volume' and that it wouldn't clump (hence the name). I was still thinking it over about whether to get it or not until the CoverGirl SA told me to try it out because she said that even after 30 strokes, my lashes wouldn't clump. So I tried it out and she was right! I even did 30 strokes exactly and no clumping whatsoever, so with me impressed, into my shopping basket it went! The Clump Crusher brush from COVERGIRL delivers 200% more volume and ZERO clumps for beautiful separated lashes. 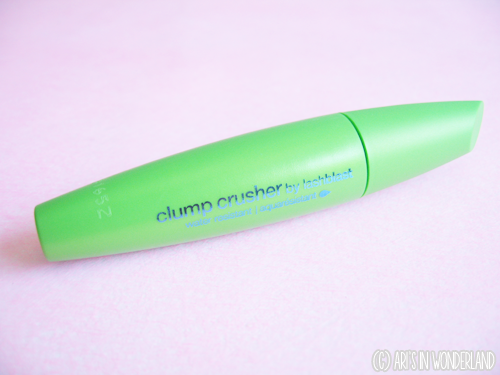 Clump Crusher mascara's innovative curved brush features a lash loading section to saturate lashes with loads of product and fine-tooth comb bristles to evenly distribute mascara. And now it's available in water resistant! The tube itself is exactly the same as the other CoverGirl mascaras in terms of its shape and size, so with design it's nothing new. But again, I just have to say I love the color! The formulation of this mascara has changed as well apparently as it's now water-proof/water-resistant whereas the old formula wasn't. The wand itself is just the right length for me. 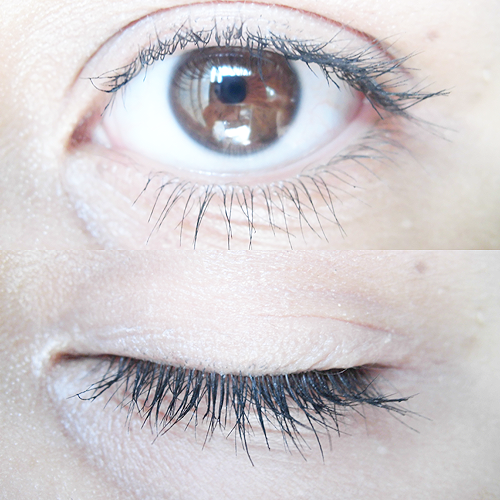 Not too long like with some other mascaras. But either way, the length of a mascara wand isn't something I'm fussy about. I was glad to see that the applicator is composed of plastic bristles. 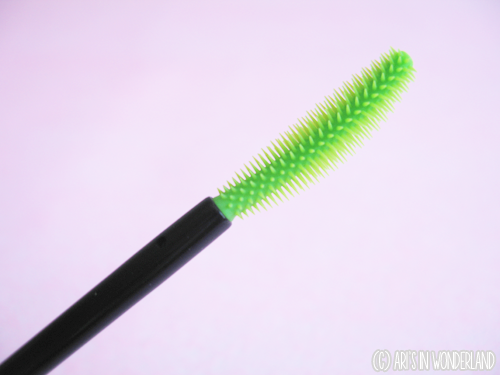 I prefer these more than mascaras with natural bristles because they tend to cause less clumping for me. Maybe that's why they went with plastic for this one! It's hard to see in the picture but the applicator is actually a little curved. The 'dip' in the curve I use for my top lashes to kind of 'scoop' them upwards as I'm applying the mascara, and the opposite side I use on my bottom lashes. First of all, forgive the fact that that my lashes don't look very curled. My current cheap curler isn't the best so I still need to find a new one. 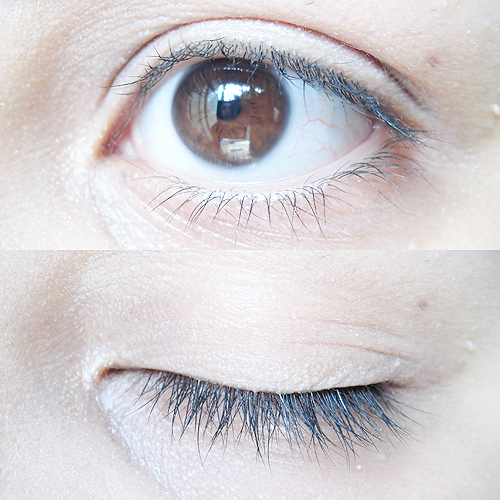 Anyway, from the pictures there's clearly a visible difference on my lashes after applying the mascara. It didn't give me amazing volume, but both my top and bottom lashes definitely look thicker and fuller! My bottom lashes look longer too. The formula of this dries quite quickly, I find, and it doesn't clump at all. I've tried applying 30 strokes again to each eye when I first used it at home and still no clumping whatsoever! I swear! Does it hold a curl? Not so much. By the end of the day the curl in my lashes are gone, but it still manages to keep my lashes 'lifted', if that makes sense, so that's good. It's not very smudge-proof either so no rubbing your eyes unless you want to look like slightly like a panda. It is mostly water-resistant, though! I splashed some water on my eyes and even if there were some small 'flakes' of mascara coming off, it remained more or less intact. It's also easy to remove with either a makeup wipe (some gentle rubbing required though) or any simple eye/lip makeup remover. Overall, I do like this mascara. 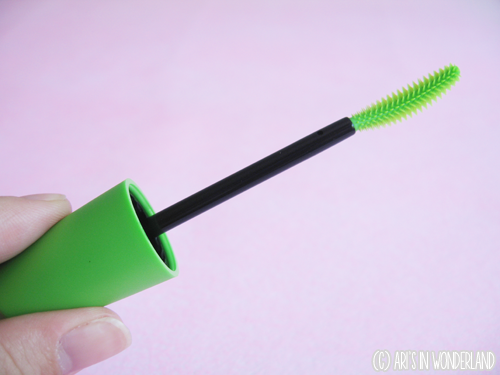 For three points, especially: it doesn't clump, it makes my lashes look thicker/fuller, and it's (mostly) water-resistant. It's currently my everyday mascara, actually! However, I know there are more mascaras out there to try and I've still got my fingers crossed that I'll find one I truly love! Makes my lashes look thicker/fuller and longer. The formula dries quite quickly. Doesn't hold a curl, but still keeps lashes somewhat lifted.